Elmer is celebrating his 25th birthday this year! We have read many of the Elmer stories which have been translated into over 40 languages as well as being made into television series. 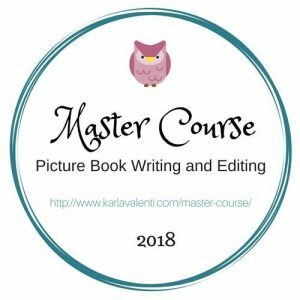 The first story is still my favourite and I have used it countless times to promote learning within a variety of topics. It is particularly good to include in a topic on colour but it’s also great as a stimulus for numeracy activities, science topics as well as arts and crafts. 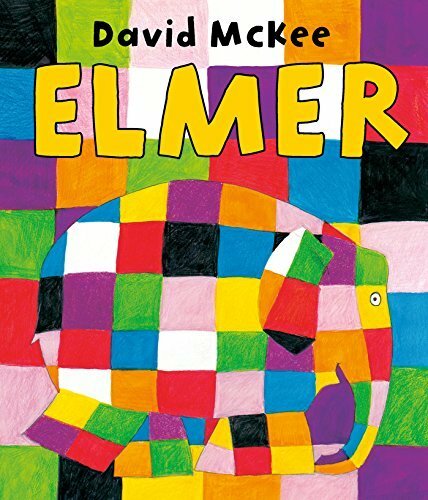 The Story: Elmer is a patchwork elephant with a colourful personality but he doesn’t like being different to the other elephants. One day he goes on a long walk and finds a bush covered in grey berries. Elmer covers himself in berry juice until he looks like his friends and none of the jungle animals recognises him. When he rejoins his herd all the other elephants are standing so still and serious that Elmer shouts “Boo” to make them jump. When it starts to rain Elmer’s disguise is washed away. The elephants find this so funny that they decide to celebrate Elmer Day every year by decorating themselves. The word patchwork is often new to young children and while working on Elmer activities I use the word as often as possible and show them a patchwork blanket. One of the challenges that I set is for children to make sure that each square in a craft is not stuck / painted or coloured the same as the one next to it (which can be quite difficult and requires some thought!). 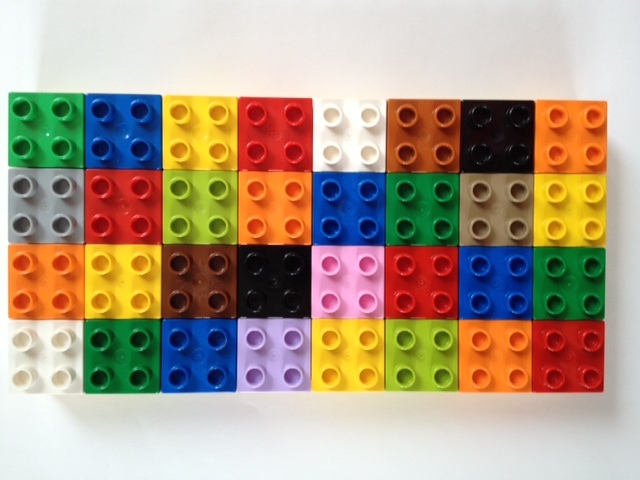 A fun activity is to make patchwork lego boards, often children like to look at a picture of Elmer to see if they can copy his colours on their board. My daughter made this Elmer inspired candle holder using a jam jar, wallpaper paste and squares of tissue paper when she was two. It’s a simple activity for the littlest of children but I have also done it with children up to the age of ten. If you are worried about young children using glass you can stick tissue paper or sticky paper squares to an elephant template. I use the template from teachers.net. Another fun craft activity is making an Elmer fridge magnet using squares of craft foam and an elephant template. 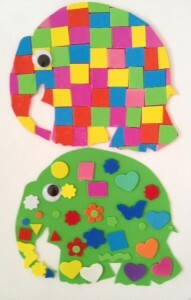 My daughter loved making her magnet and also wanted to make a patterned elephant to celebrate Elmer Day. 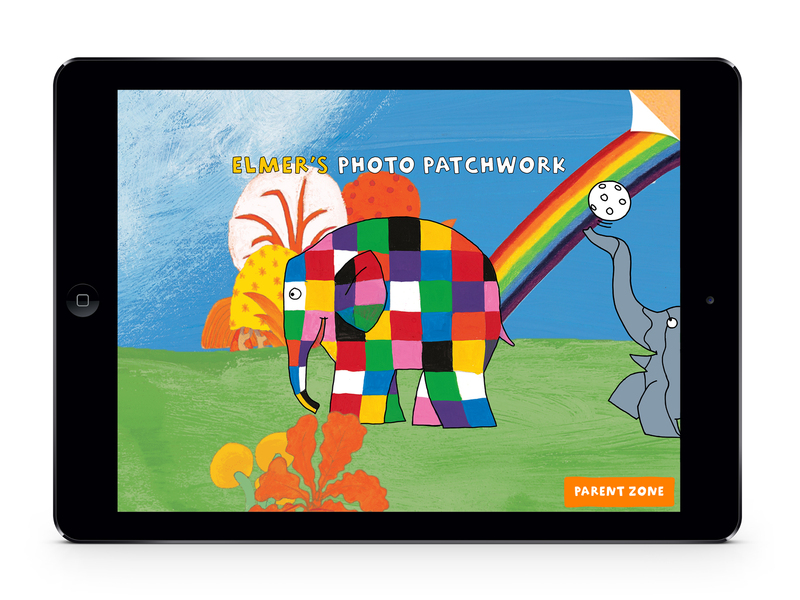 Making their own patterns gives children an opportunity to get creative with colouring, printing, finger painting or sticking and an Elmer Day classroom display with brightly patterned elephants is always eye-catching. I’ve also used the elephant template to make window decorations. The patchwork colours look really pretty when the light shines through them. We cut out a template on a plastic sheet that is used for an overhead projector then painted our Elmer with window paints. 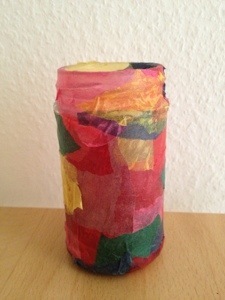 Children can also stick squares of tissue paper onto a sticky back plastic shaped Elmer for a similar effect. Elmer’s Photo Patchwork App is a fun app which is linked to the story. It’s an easy to use, very interactive iPad / iPhone app which encourages the user to decorate elephants by observing and taking pictures of their surroundings and stimulates discussions about colours, patterns and textures in the world around them. Elmer tries to make himself look the same as all the other elephants as he doesn’t like being different. I have used the story to stimulate discussions about looking / feeling / being different and have also explored these feelings and emotions in a drama lesson. Elmer is also fun to act out for a show or a class assembly. Elmer is a great story to introduce looking at patterns. Initial discussions about the patterns on the elephants celebrating Elmer Day can stimulate the introduction of repeating patterns. You can create these with Lego bricks, beads, counters, different pasta shapes or children can colour a line of elephants with a repeating pattern of their choice. Discussion about shape, squares and tessellation can also be introduced through the story. 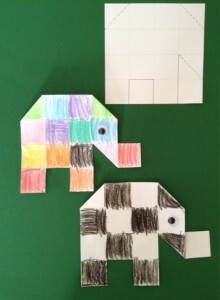 The fact that a square can be made from several smaller squares is introduced in this simple elephant making activity. Children cut out the elephant template with sixteen squares, cut along the darker lines then fold along the dotted lines to make an elephant. Making Wilbur, Elmer’s cousin, gives the children an opportunity to work with a black and white patchwork pattern. We added a wobbly eye for a final touch. There are lots of opportunities for counting in the story, e.g. counting bunches of berries on the bush, the elephants in the herd, trees in the jungle. The Elmer template can be used to create a colour by numbers worksheet, either using single numbers or for practising simple addition, subtraction, multiplication or division. For older children you could also create an Elmer sudoku puzzle. In an Early Years classroom mathematical language can be introduced when talking about the elephants in the first picture of the story. The elephants in Elmer’s herd are all shapes and sizes – vocabulary such as big, small, biggest, smallest, tall, short, tallest and shortest can all be used. General discussions about where elephants live, the difference between African elephants and Indian elephants and what elephants eat can be stimulated by reading the story and can lead to some great classroom displays. 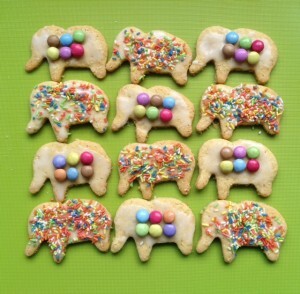 One of my favourite numeracy activities is baking so on Elmer Day in the classroom we make Elmer biscuits. 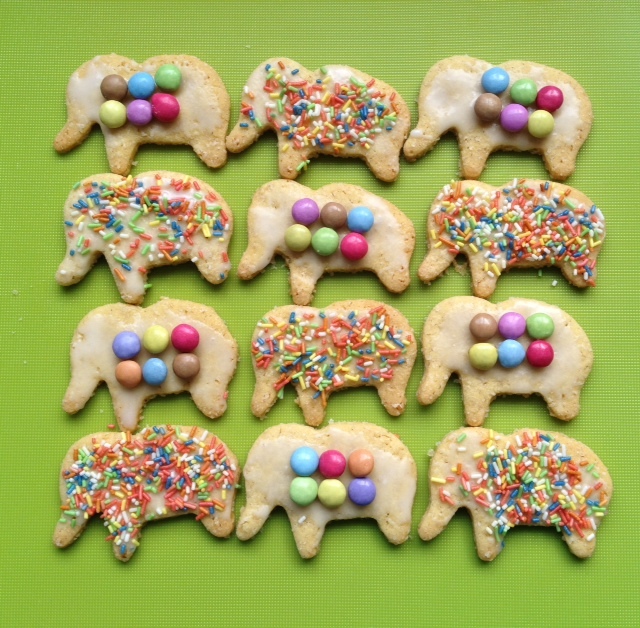 We bake elephant shaped shortbread biscuits then cover them with a thin layer of icing before adding coloured sprinkles or making a patchwork pattern using Smarties or M and Ms.
Elmer themed weeks in school or at home can be lots of fun. We would love to see your Elmer inspired activities in the comments. Other picture books for learning about colour in a classroom topic. Mouse Paint is a very simple, easy to read story which introduces the primary colours and paint mixing. Winnie the Witch is an amusing story which introduces different colours. 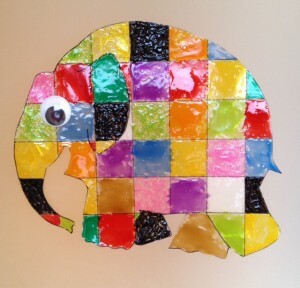 A fun art activity is for the children to draw their own version of the multicoloured Wilbur. Eric Carle introduces brightly coloured animals in both The Mixed-Up Chameleon and Brown Bear, Brown Bear, What Do You See? They’re great for introducing colour vocabulary to babies and toddlers as well as using in the EFL classroom. Wow! Said the Owl introduces a new colour on each page and ends with a beautifully coloured rainbow. Mix It Up provides an introduction to the three primary colours, the secondary colours that result from mixing them and shows how you can make colours lighter or darker. Knowing Elmer is so old makes me feel old too. 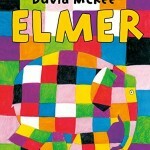 I read the first Elmer book when I was doing teaching practice! I love your Elmer themed activities! 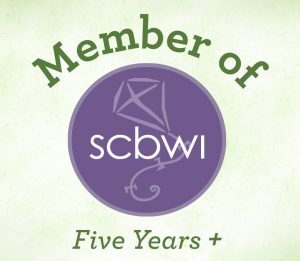 Off to Pin them now – thanks! an inspired take on a theme and all so very Elmer! 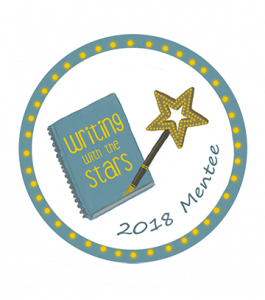 Popping by from Tuesday Tutorial Pin Party. The Elmer milk carton craft is awesome 🙂 Hope your table didn’t suffer too much! 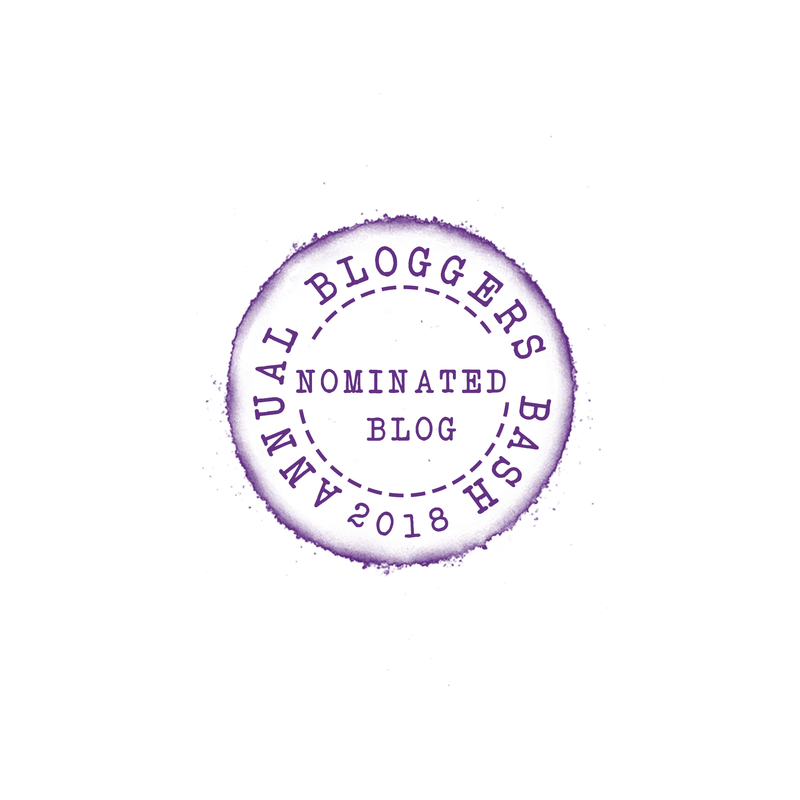 I love all these ideas, and I am yet to introduce my son to Elmer, but I will soon! Your post inspired me to look for Elmer on Amazon, and I’m so excited to see that this series is still in print! When I first started working in library land (late 1980s), Elmer was very popular! I think Elmer is still popular, he’s timeless 🙂 There aren’t only books but other merchandise too. Thank you for visiting Story Snug 🙂 I’ll look out for your Gingerbread Man blogpost. How could I have missed Elmer all these years? When I started to read I thought you were reflecting on a grown child. For head slap to self when I realized that it was a book series. After picking myself off the floor of embarrassment, I got really excited. These books and activities look really fun! Hi Lucy, thanks for visiting Story Snug and leaving a comment. Have fun with your Elmer crafts. I had no idea about the director of Sparklebox, thank you for making me aware of the situation. I’ve deleted the link and removed all pins from my Pinterest boards. Thanks Lucy, twinkl have some great resources, I particularly like their story sacks. We love Elmer here, so many brilliant activities though I’m definitely going to try some, we make elmers out of the top of big plastic milk cartons using the handle as a trunk cheap and fun! The Elmer milk carton craft looks great, we haven’t tried that one yet. We love Elmer! What great activities – and I am loving the candleholder. She did a really great job! Thanks so much for sharing with us on the #homeschoollinkup! We’ve made the candleholder several times, it’s one of my favourite craft activities. Hi Catherine, I love your Elmer ideas they are great! I had no idea Elmer was 25. Wow! I hope he is bringing learning fun to kids for many more years. You’re welcome Jill. I think Elmer and the theme of the story are pretty timeless, the stories appeal to children now just as much as they did 25 years ago. You’re welcome. Despite being translated into German Elmer doesn’t seem as well known here either.